This follows North One Television’s recent acquisition of DirtQuake and the announcement of the television company’s plan to expand the event into a global brand. Harley-Davidson has a strong commitment to the grass roots racing philosophy of DirtQuake – as a company its own DNA was laid down by the exact same competitive spirit – and supporting events such as Flat-Out Friday, Hooligan Racing and the Mama Tried event (which takes place in Harley-Davidson’s domestic market) is key in connecting with an important new demographic of both the riders taking part and those looking on as spectators, or rather those who share a love for all things motorcycling but especially Harley-Davidson motorcycles. 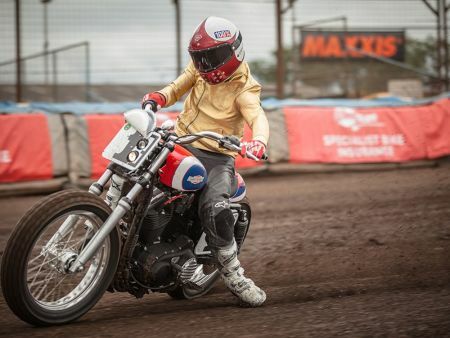 For fans of Harley-Davidson, motorcycling and fun, DirtQuake is an event not to be missed. DirtQuake takes place 7-9 July 2017 at the Adrian Flux Arena, Kings Lynn. Harley-Davidson®will be in attendance with products and a lineup of riders consisting of media and guests competing on a range of Harley-Davidson motorcycles including the new Street Rod equipped for flat track racing. If you can’t make it to this fun-tastic event, then make sure you don’t miss the action on ITV4 on Wednesday 12th July 8pm.